On Friday night, we decided to venture over to Karakoy, a neighborhood caught in what seems to be an eternal transitional period. Once known for its seedy brothels, it’s now the site of hipster cool cafés and chic restaurants. We were recently at Bej – also in Karakoy – for my company’s holiday party and during grad school, I would sometimes attend weekend classes at Sabanci University’s Karakoy building. This time our destination was Karabatak cafe, recommended to me by one of my colleagues. The goal – to get some new coffee for my French press. After grabbing a bite to eat at Namli Gurme in Karakoy, we set off to find Karabatak. All I knew was that it was by Bej, and sure enough, after only a couple wrong turns, we found it tucked away in a side street. Right when we walked in, we were greeted by several employees all who wanted to help us find a place to sit, and who surprisingly, all seemed to speak fluent English. We settled for a spot by the door right under the bike (see pic below), and took a look at the menu. 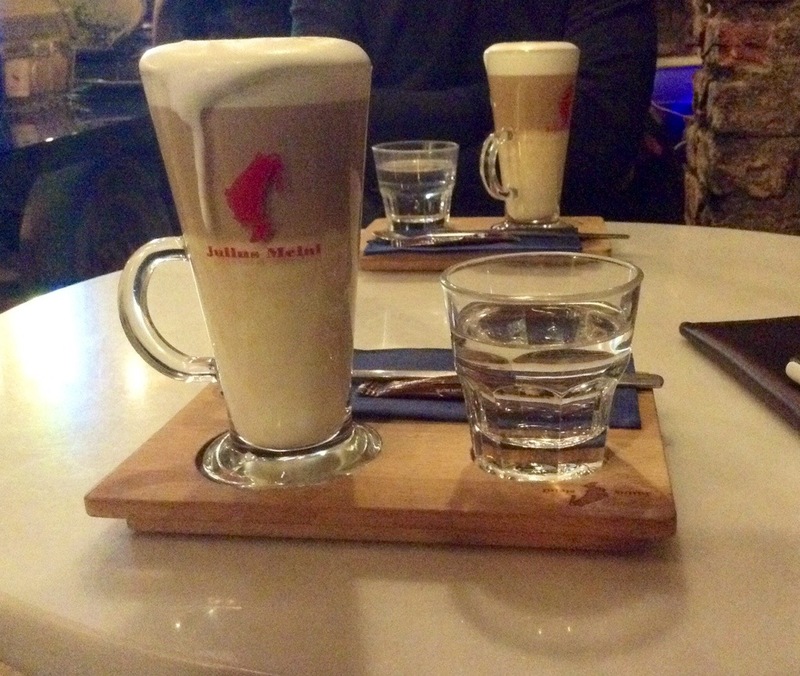 We both ordered lattes – the cafe serves Julius Meinl coffee, an Austrian brand – which had come highly recommended. Since it was already 8 p.m. by the time we arrived, the cafe had already run out of most of their desserts (including the cheesecake and brownie) so we settled on a latte cake to share. Again, the waitstaff was super helpful and explained the different options and apologized for having so few selections. The service was quick and we were soon enjoying our lattes which were delicious and the cake which was not as delicious. I didn’t have high expectations for the dessert because I generally don’t like Turkish cake, so honestly, it wasn’t a surprise – I just wish there had been some cheesecake left! While sipping my coffee, I had a chance to take a better look at my surroundings, and I had the slightest feeling that I might be somewhere else, maybe Portland or Wicker Park. There was definitely a hipster vibe going on. The main room had a tractor which doubled as a low coffee table and supported the espresso machine. 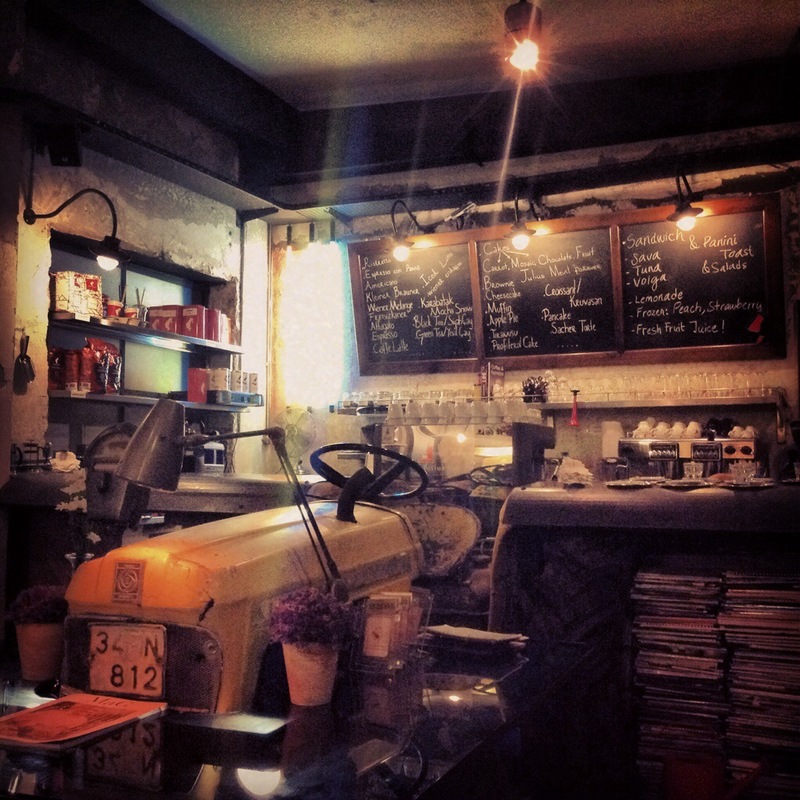 The walls were all brick with various decorations including vintage coffee paraphernalia. The atmosphere was low-key and backstreet Istanbul cool. From what I’ve heard since visiting, the place has become a bit of a tourist destination, but to me, it didn’t have an overly commercial feel to it. The only drawback was that it was too late to purchase coffee by the pound which was one of the main reasons for visiting. Not a major problem though since I am already looking forward to stopping by again, probably on a Saturday or Sunday afternoon after exploring Cukurcuma, another one of my new favorite pastimes. How to get there: Take the tram to the Karakoy stop and then take Mumhane Caddesi. Karabatak is on a side street right off of Mumhane Caddesi and its sign can be seen from the main road. A Ramshackle Modernity – That’s the name of the NY Times book review on the newly released English translation of Ahmet Hamdi Tanpinar’s The Time Regulation Institute. I was surprised to see my Turkish Studies friends sharing this article on their Facebook newsfeeds – it seemed almost too good to be true. As I graduate student at Sabanci University, I had searched for the original English translation of Tanpinar’s Time Regulation Institute long and hard. From what I could tell, there had been an earlier translation but it hadn’t been widely circulated and most people that I talked to didn’t know it even existed. Imagine my surprise when I found out through a simple web search that it was no other than a Madison-based press (Turko-Tatar press) run by a UW-Madison professor that had put the translation out. What an irony I thought. It had been right under my nose for four years and I hadn’t had the slightest clue of its existence. Imagine my horror when I realized that the Turko-Tatar’s website hadn’t been updated since 2007, and the likeliness of every obtaining a copy seemed to fade, especially now that I was in Istanbul and living on a student’s stipend. I decided to settle for Tanpinar’s better known novel, Huzur, and ordered up a copy of it’s English translation, A Mind at Peace, from one of the large Turkish booksellers. They delivered it to my door one summer in Bursa, but that summer was unbearably hot, and I couldn’t find a cool place to sit and enjoy the novel, a novel that required quite a bit from its reader. Sadly, I set aside the book in exchange for a lighter, easier summer read. I thought my ties with Tanpinar’s work had been severed. By the time I graduated and returned to the US, the quest for an English copy of Tanpinar’s Time Regulation Institute was a distant memory. I tucked my copy of A Mind at Peace away in my antique traveling chest, and felt a slight pang of guilt everytime it caught my eye. After all, I had given up about 3/4 the way through – rarely, do I leave a book unfinished. I would have altogether forgotten about the other, more desired book, The Time Regulation Institute, had it not been for the recent review in the NY Times. Blindsided by the review, memories came tumbling back. I told anyone and everyone about the article and the new translation. Surprisingly, some of my Turkish friends hadn’t ever heard of the book. Most knew Tanpinar but had no idea any of his books had been translated into English. Luckily, the book’s translation had Maureen Freely’s name on it, and I knew I was in for a treat. I downloaded the book the day it was released… and now.. I am just waiting for the right time to start the first page. This one deserves the perfect timing. I’ve been waiting for almost 4 years, and I’ll wait a few more days. Fun Fact: Kalem Agency, the company where my roommate, Nazli, works supplied the photo for the NY Times article! My first trip to Turkey (Bursa) circa 2009 seemed to be the perfect time to try my hand at blogging. I set up a no-frills Blogger account, and I wrote about my first impressions. Of course, these were the standard impressions of any American finding herself in a foreign country, in a city of the beaten track (or at least, tourist track). The winks too many, the western style toilets too few, and the magical Turkish baths a welcome respite from the dirt (and second-hand smoke) of a growing metropolis. Looking back on these first observations I squirm at the absolute naiveté of it all. Thankfully, only a few friends and family members were privy to my first foray into the world of blogging. I was reluctant to continue blogging during my graduate studies at Sabanci University. Short on time and hardly enough energy to make it through Professor Berktay’s assigned readings, I couldn’t fathom keeping up a blog. Extra time was spent taking cat naps in the library, tea breaks in one’s office, and prolonging the weekend breakfast at the yemekhane (cafeteria). Writing was for analyzing gender in the early Turkish education system and minority rights in the modern Turkish Republic, not for leisurely blogging. 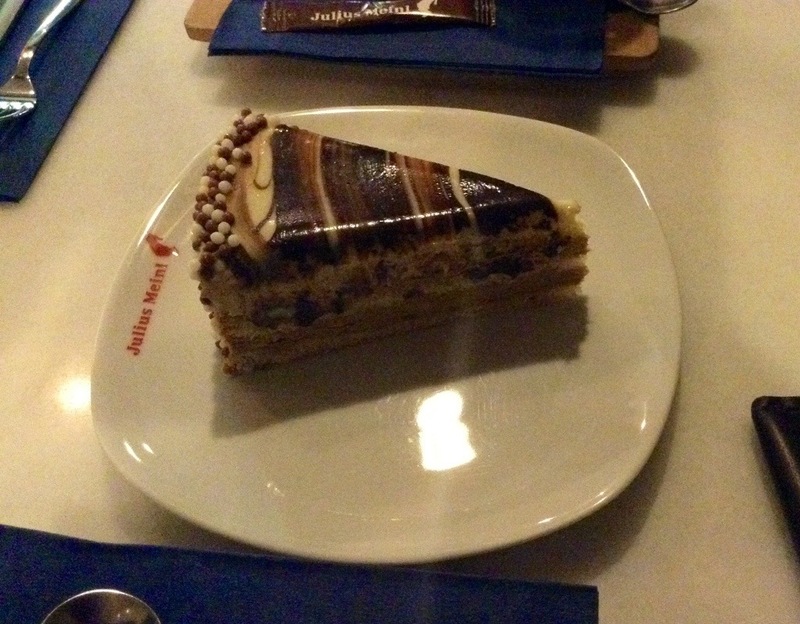 I envied my classmates who found the time to post a few snippets of their life in Istanbul. Surely their friends and family back home were more than appreciative. My second attempt at blogging was surprisingly quite successful. As the Resident Director for one of the US State Department’s scholarship programs, my target audience was my students’ parents. With strict limitations on the students’ own internet and phone usage, I felt a blog would be a great way to offer their parents some peace of mind. With sparse text and lots of pictures, the feedback was overwhelmingly positive. This blog is still live and not a half bad resource if you want to explore Bursa or learn more about the NSLI-Youth program. Back in Turkey, after a failed job search in the Midwest and a stint on the East Coast, I have transitioned into a career in marketing and business development. I now feel obliged to approach writing as a targeted marketing tool, and my creativity is limited to my reign of the office’s social media. But, for some reason, I fail to use 140 characters as creatively as many of my contemporaries, let alone the Gezi Park protestors. Lucky enough to follow these change-makers, I feel privileged enough just to be able to retweet their words on my personal handle. With a full-time job and plans to start a small business on the side, I certainly didn’t feel like I had the time to start another blog. That is – until my friends encouraged me to start one, and not just any blog, but a restaurant blog, in fact. Of course, I had plenty of excuses to offer, but perhaps the one that weighed most heavily on my mind was that I didn’t want to be that expat. But friends kept urging me. Start one, they said, if not for others, at least for yourself so you can remember all the places you go!